Student volunteers make sure Summer Orientation 2011 runs smoothly. "Where do we line up for class registration?" "Are refrigerators allowed in the rooms?" "Who is handing out free doughnuts?" "Can I keep a fat cat in my dorm room?" "Do students really kiss banana slugs, or is that an urban legend?" 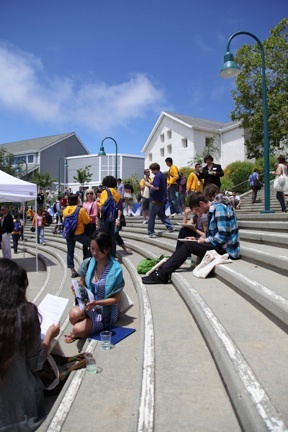 This year, 3,300 incoming first-year students, 890 transfer students, and a total of 7,300 students and family members, signed up for UCSC’s Summer Orientation events, which took place July 19 through July 26. The turnout shows a significant increase over last year, when 6,800 people signed up. Orientation is a time for students to take care of business before the school year starts, and have a good time in the process. They sign up for classes, chat with yellow-shirted student volunteers, learn about student organizations and how to find their way around the wooded, 2,000-acre campus. Logistics and way finding are two essential aspects of Orientation. With this in mind, incoming first-year student Phil Garbrecht, 18, of Orange County left the car in the garage, boarded an Amtrak train, and took a Santa Cruz Metro bus to campus. Phil’s father, Steve Gabrecht, marketing manager for a computer software company, figured that his son had better learn the public transportation system, considering that first and second-year students can’t bring cars to campus. "Managing finances," Steve Garbrecht said. "Studying all the time," Phil Garbrecht said. "Getting a good room-mate,"his father added. As they walked around campus, parents could not help remembering their own student orientations. A few of them openly expressed their wishes to get into a time machine, roll back the decades, and somehow enroll at UCSC with their sons and daughters. Frank Alvarez of Ventura couldn’t help but feel a little jealous as he made the rounds with his son Anthony Alvarez, 18, who plans to study biology as part of a pre-med course. "If I was his age, I’d be coming here," said Susan Wilde, a Berkeley-based licensed clinical psychologist whose son, Andrew Wilde-Price, will attend UCSC this fall. Andrew, who was reading Howard Zinn when he was 10, would love to be a history professor, or possibly a curator specializing in ancient cultures, she said. A proud mother, she loves to talk about his far-ranging ambition and his excitement about going to the university. "He said he was going to bring 200 books with him to college,” she said. “I told him, ‘honey, there won’t be enough room.’"
Alas, these parents won’t be able to matriculate along with their offspring. At least they can take some comfort in the fact that their parenting efforts have paid off so far. Such was the case for Tom and Susan Kossack, whose son, Chris, 18, will study applied physics at UCSC. Tom Kossack reflected back on how he used to watch his son’s report cards closely while setting his sights on college. "I was not a helicopter parent," insisted Tom Kossack, a newly retired high school teacher in Sacramento. “I was more like a turbojet fighter. We were very efficient. I paid close attention to his grades up through his junior year of high school. I told him I would chill out after that. And I did." "Much to our son’s amazement," his wife added. By the time Chris’s high school career was over, it was clear that they had nothing to worry about. Various universities were courting their son, who had been on the hard-sciences track ever since taking an inspiring advanced-placement physics course. But Chris had his sights set on UCSC for several years. Besides, his parents were wowed by the fact that UCSC physics department chairman David Belanger fired off off an email to Chris, asking him if he could give a personal tour of the campus. "It was not a programmed thing," his father said. "It was not a script. The email was detailed. What are your questions? What can I do for you? Can I walk you around?" Aside from campus tours and picnic lunches, there were opportunities for team building, friend making and mood lightening, including some challenging and deliberately silly activities. Among the activities: participants blew feathers in the air and tried to keep them aloft for as long as possible, tried to transfer 33 pounds of Skittles candies from one big bottle to another, and played tennis matches using clipboards as rackets and wadded-up papers as balls – while simultaneously walking across the campus. The idea was to get people out of their comfort zones, in an enjoyable and low-key way. That, after all, is what university living is all about – exploring the unfamiliar and pushing boundaries. For the record, small fridges are allowed in dorm rooms, while obese cats – and any other form of pet except fish– are definitely not. As for that urban legend about the banana slugs – no comment.